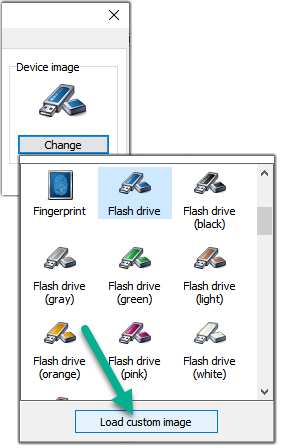 USB Safely Remove Help - How to rename a device or change its image? 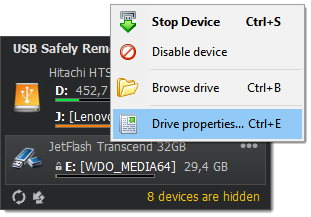 Unlike Windows USB Safely Remove displays real device names, given by a device manufacturer. Moreover, when you have several devices of the same type or a manufacturer has given an "obscure" name to a device you may assign a more intellegent name to those devices. 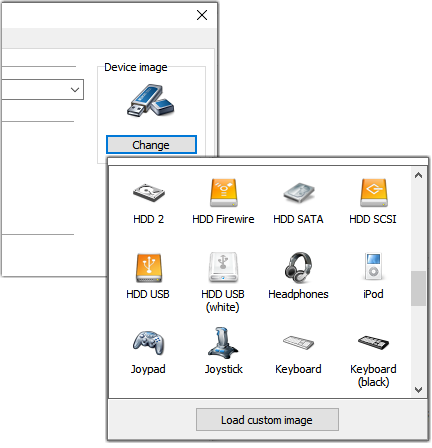 When you have several external drives with identical names, you may prefer USB Safely Remove to display automatically drives' volume labels instead of device names. 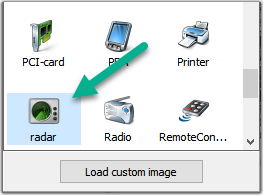 To do so enable the option "Display storage device volumes" at the "Look and Feel" tab of the program options. The internal image storage in the program actually is a sub-folder DeviceImages of the program installation folder (e.g. "%programfiles%\USBSafelyRemove\DeviceImages", when user adds his own custom icon it saves to "%appdata%\USBSafelyRemove\UserDeviceImages"). If you already have an icon in ICO format just copy it to the folder described above and restart the program, then enter to the device properties and select your newly added icon among other images.